KPMG in the UK is a leading provider of professional services, including audit, tax and advisory specialisms - delivering integrated solutions to business issues. In the UK, we have over 12,000 partners and staff working in more than 20 offices. Being part of a strong global network of member firms gives us a truly global mindset. With passion and purpose, we work shoulder-to-shoulder with clients, integrating innovative approaches and deep expertise to deliver results. During the last three years we have been working with the Cabinet office to run the Reimagine Challenge - a unique programme that brings ideas and best practice from across the Civil Service and private sector to show how approaches to certain public services can be ‘reimagined’. Join us to find out more and see how you can get involved. CS Healthcare is a mutual health insurance provider who, since 1929, have specialised in protecting the health of civil servants. Our mutuality means our members are at the heart of everything we do. We pride ourselves on giving high-levels of personal service and providing cover for both individuals and groups. Fast Stream and Early Talent offers graduate, school and college leaver opportunities. The Fast Stream provides accelerated leadership career paths through 15 different schemes and current civil servants may apply with or without a degree. The Fast Track offers six higher apprenticeships to non-graduates. Civil Service HR (CSHR) supports the government workforce, helping departments and professions to build a brilliant Civil Service. CSHR provides expert services and offers guidance in areas including pay and reward, talent management, employment policies, workforce planning, and learning and development. Civil Service Local is part of the Cabinet Office Civil Service Group. Our purpose is to bring together departments and agencies within our localities to deliver actions and opportunities for civil servants that will bring to life the vision of a Brilliant Civil Service. The Civil Service values the benefits that Reservists bring to their workplace, including the development of transferable skills. Reserve service is challenging, rewarding and presents opportunities that you can’t find anywhere else. Leadership is just one of a range of transferable skills that benefit over 1,750 Civil Servants who are in the Reserve Forces all across the UK. Cognizant is one of the world's leading professional services companies, transforming clients' business, operating and technology models for the digital era. Ranked amongst the most admired companies in the world, our unique industry-based, consultative approach helps clients envision, build and run more innovative and efficient businesses. The Civil Service Pensioners' Alliance (CSPA) is a membership organisation that lobbies on behalf of pensioners from Civil Service and related pension schemes. We are an independent, non-party political organisation. CSPA is recognised by the Cabinet Office, other Government Departments and Agencies as the body mandated to speak on behalf of Civil Service pensioners. The government spends £49 billion each year on external contracts which represent a vast array of important (and often life-enhancing or life-saving) goods and services. When we spend this money well, we are capable of achieving excellent value for money and shaping world-class services. To help achieve this, there are around 4,000 civil servants working in commercial roles spread across every government department, and collectively we make up the Government Commercial Function (GCF). In its dedicated hub, the Government Digital Service (GDS) will give insight into the transformation work it's doing with departments to build public services that best meet the needs of their users. Interactive and instructive demonstrations will run throughout the day. These will focus on a range of the things GDS offers, including Digital Marketplace, GOV.UK Verify, GOV.UK Notify and GOV.UK Pay. You'll also be able to book into 1:1 advice sessions to find out how GDS can help you. HHRUK provide HR solutions and services, operating nationwide to deliver dynamic solutions to both Public and Private sector clients. We deliver HR transformation while supporting the journey to Cloud HCM, pensions and TUPE advice as part of service in/out sourcing and HR expertise to organisation change programmes. Marine Scotland is the part of the Scottish Government that is responsible Scotland’s marine and freshwater environments. Our Mission is to manage them to make sure everyone benefits from them both now and in the future. Under the strap line of ‘giving students a start’, the award-winning MOD Education Outreach Programme has for over 16 years been working with Colleges, Academies and Schools across the UK, where diversity is often> 60%, over 100 nationalities and languages are present, and many students are designated as being ‘at risk’ with curriculum, personal development and employability skills support. Over 2,500 students every year, many of whom have no one in work in their family or have missed out on any work experience, benefit from support, either in the classroom through mentoring, talks, and mock interviews, or linked in with a ‘taster’ visit to Whitehall to provide a flavour of the workplace, our facilities, our heritage, meet colleagues and look at opportunities across the public sector. Many also get the chance to role-play the PM and other Ministers in the acclaimed fast-paced MOD Crisis Workshop , trying to solve an overseas crisis and deliver a ‘press conference’ – all geared to helping the next generation understand roles and responsibilities across govt. Operational Delivery Profession is the public face of the Civil Service and we help keep the country running. We are the largest of the Civil Service Professions with around 230,000 of us working across Government at both home and abroad. Our work supports Civil Servants who run the front line services citizens use such as processing visas, passports and driving licences and paying benefits and credits. PCS is one of the UK’s major trade unions with almost 200,000 members. Recognised in civil service and government organisations to negotiate pay and conditions PCS is a democratic campaigning organisation offering civil servants a voice at work and continuing professional development. 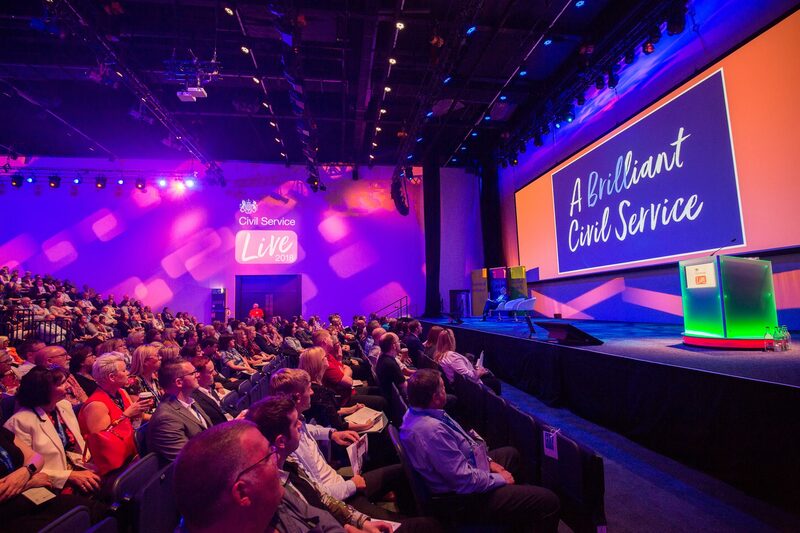 The Specsavers Corporate Eyecare team are pleased to attend Civil Service Live to showcase their eVouchers which are cost-effective and virtually administration free. The quality and reputation of Specsavers is matched with individual service from expert opticians and experienced account managers. We look forward to meeting you on our stand. The Charity for Civil Servants supports all civil servants, both past and present, when times are tough, offering practical, financial and emotional support. The vision of the Charity is a lifelong community, offering effective help and advice with whatever problems they may have. BSI is recognised by the UK Government as the National Standards Body and represents UK interests at the international and European standards development organizations. Its role includes helping to improve product safety, protect consumers, enhance business productivity, enable innovation and facilitate trade by developing best practice and encouraging its use. The Civil Service Commission regulates recruitment into the Civil Service: providing assurance that appointments are on merit after fair and open competition. Additionally, it helps promote the Civil Service values and hears complaints under the Civil Service Code. The Commission is independent of Government and the Civil Service. The University of Bath has launched a specialist MSc in Public Policy for working professionals. MSc Public Policy delivers inspiring approaches to public policy through highly structured, online content and two residentials, allowing students to draw upon their professional experience. Visit us in London or Newport to explore MSc Public Policy. Here at Commsave we offer easy, flexible savings accounts and access to affordable loans for just about any purpose. As a not for profit co-operative, we are owned by our members – meaning you have a say in what happens to your money! Providing excellent service, this benefit is available to all Civil Servants, nationwide. SAP is the market leader in enterprise application software, helping companies of all sizes and in all industries run at their best: 77% of the world’s transaction revenue touches an SAP system. SAP turns customers’ businesses into intelligent enterprises. With a global network of customers, partners, employees, and thought leaders, SAP helps the world run better and improves people’s lives. BT is one of the few organisations that works across all areas of the UK public sector, enabling organisations to meet the challenges of controlling costs and maintaining excellence, to be able to access, record and share information both within and across agencies and departments. We believe that working more flexibly, sharing physical infrastructure and information will be a critical area for the Civil Service going forward. We call it the Art of Connecting, it’s about providing you with the ability to connect and communicate whatever you need to, whenever and wherever you are. The Civil Service College is a provider of high quality, bespoke training for those working in the public sector and civil service, here in the UK and abroad. Our trainers are current and former Civil Service and Public Sector professionals who are experienced and skilled in delivering specialist training. Departmentally accredited by public sector organisations such as the Ministry of Defence and the NHS, Kahootz’s online workspaces can be customised to handle many of your business requirements. This includes document management, stakeholder consultation, policy development, project management and much more. Start your free 30 day, no obligation trial today. We empower people to be their best for performance & wellbeing. We apply the latest evidence based research in Positive Psychology through innovative solutions with scalability across global organisations. We give confidence to individuals, teams and organisations to humanise work through platforms for dialogue and collaborative learning. Pinsent Masons is a full-service international law firm. We have enjoyed working with Central Government over the last 25 years to deliver strategic and transformational projects and have helped Government deliver on many high profile matters aimed at delivering on public policy and the citizen agenda. We work with most of the Central Government departments and the their arms-length bodies, providing advice across a full range of legal services. The FDA is the union for senior managers and professionals in public service. We act as a powerful voice for public services and the people who deliver them. As well as our core offer of representation, the FDA also provides skills and development opportunities through our training arm, FDA Learn, and offers assistance and advice through our members services with FDA Portfolio. The Devolution and You programme is designed to improve devolution capability across the One Civil Service in collaboration with the Scottish and Welsh Governments. It aims to increase civil service understanding of devolution through tailored learning opportunities, a communications campaign and cross-administration interchange. To discuss sponsorship opportunities give us a call!